I gave my wife this plaque a couple of weeks ago. The verse is referring to a kind of peace that God provides when we bring our requests to Him in prayer. Recently I was reading this verse and got curious about the word "understanding," so I looked up the Greek word. Do you know what it means? It means "mind"! See for yourself. It gave me a giggle... God's peace will blow your mind! Then I got to looking up other words. Moving backwards, I looked up the Greek word translated "surpasses" (or "passes", depending on the translation you're reading.) It actually means to stand out above something, to be superior to it or to have more authority. 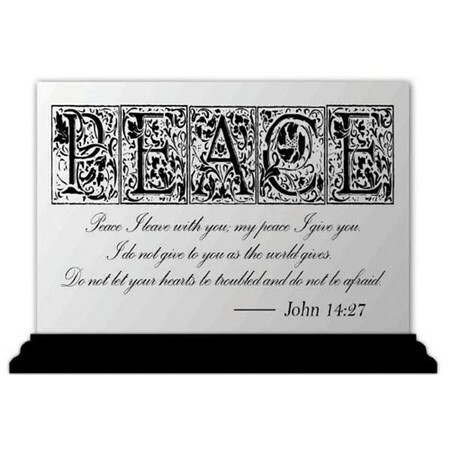 So you could read it as saying that God's peace actually holds more authority than whatever's in your mind. Nice! I noticed that there is actually a word that is translated into the English word "mind", so I got curious what shades of meaning it might hold. I looked it up, and it actually means your thoughts, the stuff that goes on in your mind. Then to be complete, I looked up "heart", and guess what it means? It means "heart". You know, the thing that pumps the blood through your body. So the peace applies to both what goes on in your mind, and what goes on in your body. Have you ever been stressed out? It affects your mind, doesn't it, but it also has physical repercussions. It makes your heart beat faster, for one thing. If you bring your requests before God in prayer, this verse seems to promise that those sorts of symptoms will be a thing of the past. So, based on those simplistic, shallow-end-of-the-pool word studies, you might restate the principles in that verse this way: "God's peace is far superior to and more authoritative than any solution you could figure out on your own. Let it do its work, and it will calm your thoughts and de-stress your body." How's THAT for something you can use on a Monday morning?